Cute little Soapstone Pig Totem Carvings. Soapstone Pig Totem emits a calming yet stimulating energy supporting the release of old routines and creates an openness for new possibilities. 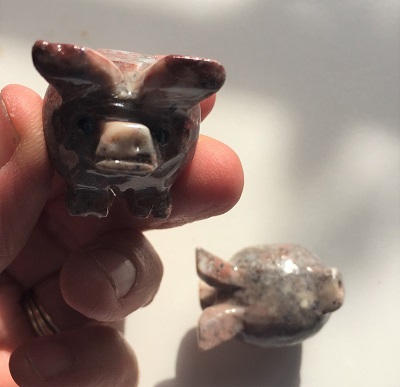 Soapstone Pig Totem facilitates the necessary change to eliminate lazy behavior, overcome procrastination, and give one an appreciative attitude and zest for living joyfully. Soapstone’s energies are helpful for getting one moving and ready for whatever comes next. A stone of manifestation, the soapstone pig totem is a reminder of how physical creations are literally carved out of imagination and intentions. Soapstone pig totem supports endeavors that are FUN, challenging, and launch you right out of your comfort zone. 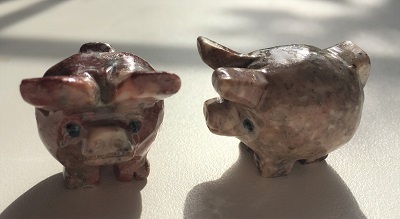 Use soapstone pig totem energy to fearlessly stand strong and truthful in your personal space especially when life circumstances feel challenging. 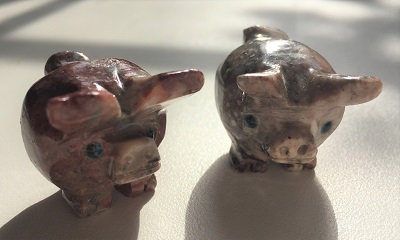 Use soapstone pig totem energy to get back on track with personal goals, professional career advancement, and for successful project completion. In healing, Pig totem may be helpful for those with skin issues and body temperature challenges. Soapstone may be used in the treatment of fat digestion, as well as, to stimulate the liver and gall bladder supporting optimal organ functioning.